About this episode: A conversation circled around our clogged business and personal lives. 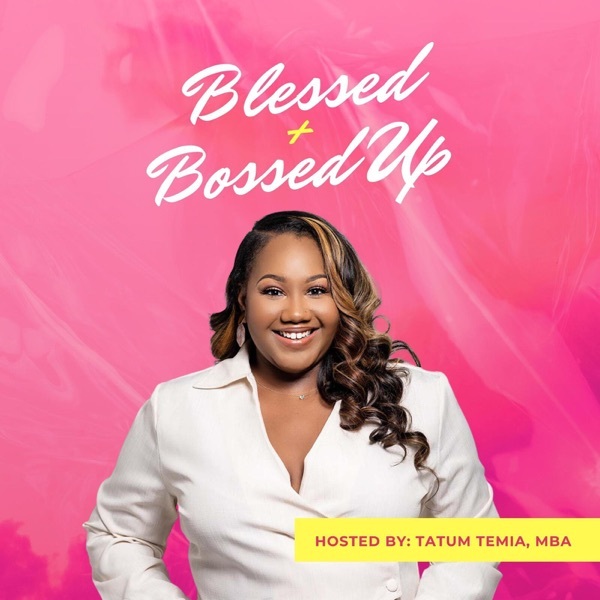 In this episode of the Blessed and Bossed Up Podcast, Tatum talks about how clogged entrepreneurs can become while on their journey of making God the CEO of their lives. She shares an on time revelation of what the Lord has spoken to her. “My people are clogging up their businesses with things that do not apply to them. Their minds are cloudy. They are running on a hamster wheel not getting things done. A lot is going on with no clear vision, no clear objective, no clear goals. Other than they want it to work and they want it to be successful.I need them to unclog their eyes and their ears so I can get straight to their heart. My voice is getting drowned out by the noise. Teach them how to unclog!” Time Stamps: 16:17 Sometimes investing in yourself is getting before God. 19:02 Tatum gives practical tips on how to become unclogged. 19:22 Tatum give pointers on how to approach God on getting unclogged. 20:25 Tatum talks about missing what God needs from us because everyone’s voice is louder than God’s Announcements: Giveaway ! We are giving away 4 VIP TICKETS to the God is my CEO Tour! Rules to enter. Follow @Blessedandbossedup Follow @tatumtemia Upload a video to your story explaining how the Blessed and Bossed Up podcast has impacted your life. Join us on the God is my CEO Tour: www.Godismyceotour.com Bossed Up Takeaways Step back .Take a break from everything. Get off social media. Close the laptop. Get before God. Episode 91: Who are you listening to? Episode 87: I have an idea, now what?! Episode 78: Get out your own way! Episode 74: Can I just be transparent for a moment? Episode 43: Can we vent for a sec...again? Episode 25: Do you need a degree for Entrepreneurship? Black Girl Boss Essentials: Can we just vent for a sec? In this episode we sit down with entrepreneur and financial planner, Marcus White to discuss retirement for entrepreneurs, why everyone needs life insurance, how to develop the wealth mindset, and more. Press play! Black Girl Boss Essentials: Get Your Mind Right! In this episode, we discuss the lack of inclusion with Sophia Amoruso's Girl Boss Rally and the trending 2014 Forbes article, What Black Women Millionaires Do Differently. The Forbes article can be found at the link below: https://www.forbes.com/sites/annabahney/2014/10/31/what-do-black-women-millionaires-do-differently/#6a96c11213a0 Follow us on Instagram! @blackgirlbosses Press play! Too many women walk around daily with a mask on as if everything is okay. In today's episode, Tatum and Milan take off their masks and have a heart to heart about depression, struggle, and how it affects their businesses. Our most hilarious episode yet. Just press play! This is an episode that you will have to listen to a few times! Grab your journal, pen, computer, or whatever you use to take notes because our interview with Raevyn Jones is full of gems! Raevyn Jones is an award-winning entrepreneur who launched her first business at the age of 21, and has since become an advocate for people to do what they love and divorce their 9-5. Tatum interview's Raevyn about her journey as an entrepreneur and how she has been able to make it to 6 years self employed. In hot topics, Tatum + Milan discuss YOUR president's hiring freeze and why now is a better time than ever to start a business. Follow Tatum, Raevyn, and Milan on Instagram! @tatumtemia @heyylan_ @raevynjones Press Play! On Episode 3, we sit down with Tula Alfredo of Tula Talks Entertainment and discuss her journey of being a #blackgirlboss. We discuss Hidden Figures, Wale's new video 'Black is Gold', and Milan learns that she isn't Michael B. Jordan's type :-( To learn more about our guest, Tula Alfredo, visit her on the web at www.TulaTalks.com, IG: @tulatalksent + @tulaalfredo Send us questions + wins of the week to blackgirlbosses@gmail.com Press Play! In Episode 2, we discuss hot topics and share tips on how we are able to stay productive in business while still working a 9-5. We also discuss Shonda Rhimes Masterclass, the new Americas Next Top Model, and Oprah + Michelle Obama's farewell interview :-( Send us your question + wins of the week to blackgirlbosses@gmail.com Press play! Episode 1: BGB Live Pilot!